In the Year 1’s session today they was set the same task we had last year, to model assets with a restricted polycount to make them aware of polycount limits in games also known as a budget. 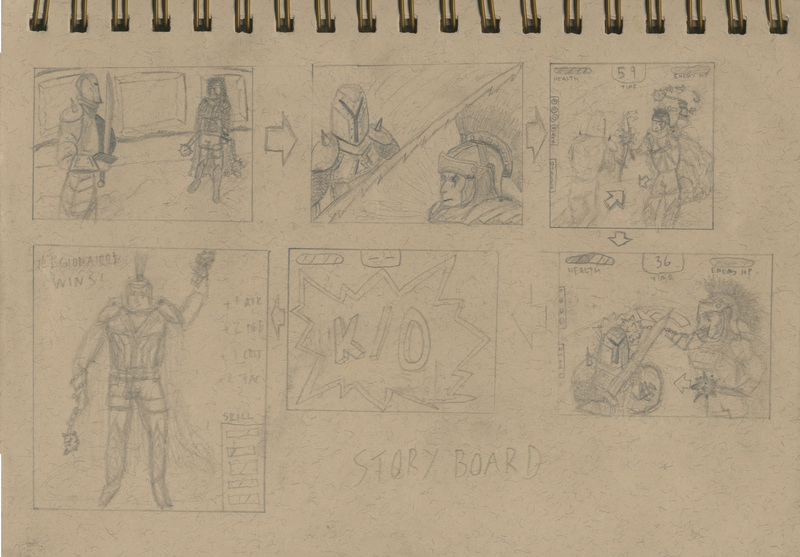 They proceeded to model the items they had drawn by card and by the end of the session handed in what they had got. Paul then proposed for the guitar controller to be done by next week in 128 polys to everyones disbelief and shock, operant conditioning was applied to this of a reward of a sausage roll if someone could complete it in half of that so 64 poly’s…challenge accepted. Realising i did the guitar last year i did it in 188 polys, now i thought it would be beneficial to myself to try model it again as fast as i could in as low poly as possible. In around 5 minutes i had a 88 poly guitar, loosing some loops and strategically placing certain edges to create a similar shape without the loop i managed to get it down to 68. Not much could be seen to do, then i realised i still had my reference image underneath my model for shape…this cut it down to 48. So i had won id done it, but i didnt stop there i wanted to optimise it to the lowest possible it could be still looking like a guitar. Fully optimised I managed to get it to 39 poly’s by this time a had the majority of first year surrounding me. So in around 15minutes i had a 39 poly guitar, which was modelled in 5minutes then it just took some thinking to how i could keep the shape but lower the polycount. In comparison to last years 188 which admittedly i loaded up and it was horrific topology I can clearly see how much i have come on since this time last year. The 1st years now dislike me as I have proved it can be done and in very little time giving them no excuses…sorry guys! Categories: 3d Realisation, Year 1, Year 2 | Tags: 3D, 3D Model, Autodesk 3ds Max, Brief, optimised, PHASEgaming, Polycount, progress, Topology | Permalink. This post will be an overall reflection on Year 1 Games Design and how i feel i did well and where i could improve in places. This year for everyone was seen as a toolbox year, a year to build our skills in the programs that we would eventually be using in the next years and industry. 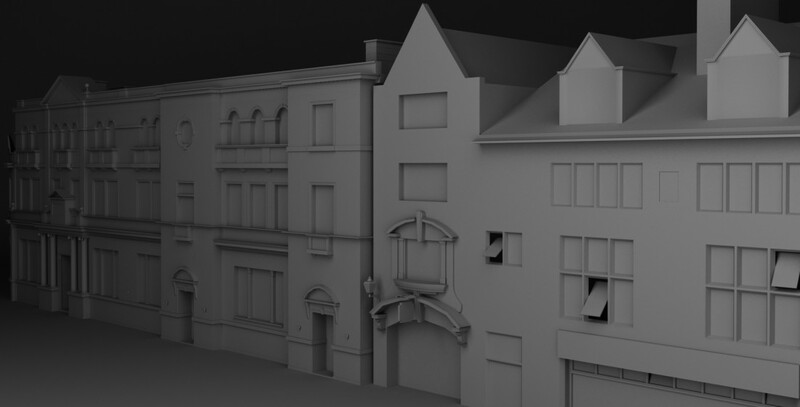 Programs that in most cases for myself was completely alien, the likes of 3dsmax i had never come across before but it was the program i felt i would need to advance in the most. The beginning of the year i dont think most of us had any idea on what we would like to do in the profession due to unexperienced views on the work and generally being gamers rather than games designers. Personally i felt that progress along the year was huge, i couldnt draw very well to begin with now i am at terms with perspectives and improving in the field of life drawing. This was much thanks to the creative futures module, my adaptation brief i believe was my strongest in terms of creativity on my behalf and it really made me figure myself a design process out for how i would go about conquering my work. Other things i felt i improved on was definately the 3D aspect of work, first i struggled to grasp the concept of modifiers, texturing and modelling in general but with practice i can now model low poly models as long as i sit and think about how to go about the topology of it. If i was to be critical of myself i would definately say i could have done alot more to improve my work, due to certain circumstances in my family and friends i struggled coping with towards the end of the year and this did see a drop in my productivity. Determination will be a key factor for next year and i intend on focusing purely on my work but allowing myself social time aswell but not if it will jeopodise my work rate. This year things i wasnt so pleased with was my use of flash, yes i got a working timeline, game and animation but i was never confident in the program it was used because we had to i felt and thats not how i should have looked at it. When i nfelt that way what i should have done was asked for maybe some extra tuition on the area or taken time at home to really get a grasp of the program, so this is reflection on that. The main thing for the future is to keep on top of work dont be that guy who says “oh ill do it next week…its not in for another 4 weeks” get it out of the way and sorted so that im always 1 step ahead of the game. Currently im unaware on my marks but im hoping that i have done well asd i really want this to work for me. Over the summer me and a few colleagues have planned to do a small group project that we have been discussing throughout the year and really keep on top of what we want to do for a profession, you cant just sit back over the summer and relax otherwise it will hit you like a ton of bricks when the work starts to come thick and fast again. Alongside some self initiated projects id like to set myself to focus improving my skills and looking into 2nd years blogs to see what we will be going into and focusing on getting a head start on that. Categories: Modules | Tags: PHASEgaming, reflection, Year 1 | Permalink. Previous work: blog 1, blog 2, blog 3, blog 4. 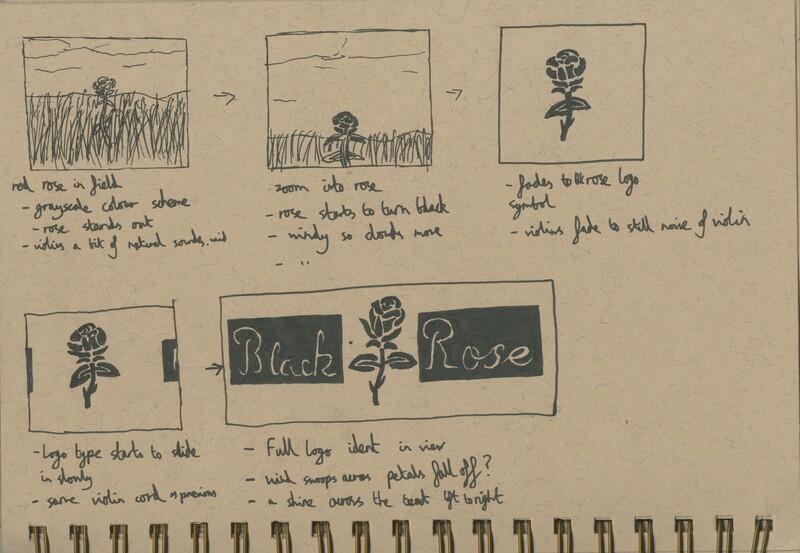 As explained in the last part of this project i was moving onto the design process of a logo for both black rose and rusty tank being undecided on which to choose. Using different typography, style, and size to try fine tune what i want my ident to look like. 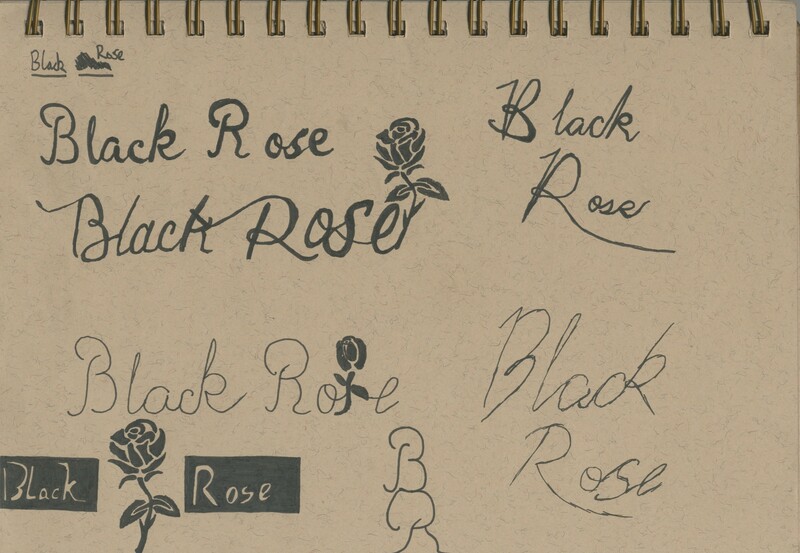 These are some of the designs that i came up with as you can see i followed the path of an elegant look to the black rose to complement the beauty of a real rose. My favourites were the bottom left with the inverted text font and rose stencil and then the two in the top left with the elegant flow to the font, I particularly liked the rose joined onto the end so i tried to implement that in other designs. These designs i was really pleased with the army stencil path focus was particularly a favourite of me and my peers, i tried to implement army military related themes to the ident with the actual rusty tank drawing but specially the army star for the letter A which was a nice feature. After this i took both into Photoshop to have a digital version of them so i would be able to import into adobe after effects when eventually making the ident. Here is my black rose final ident digitally, i am pleased with it as it has met my original objectives of being elegant and representing a roses beauty with various features from different ident designs. 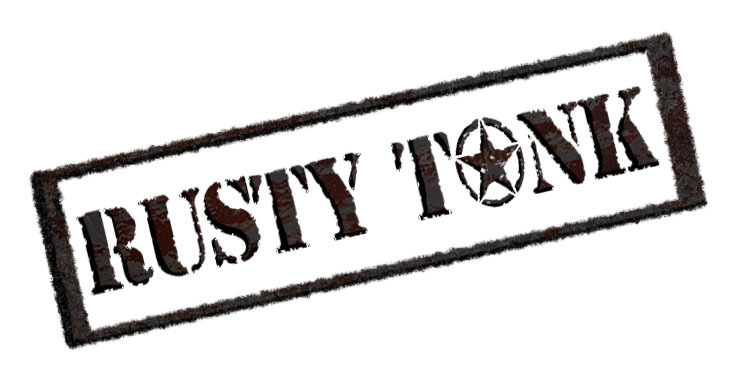 I also added a branded style box around the font to try implicate that this ident might be indented or embossed onto a vehicle, then rotated it to a slight angle and added a painted shadow to the left of the font. 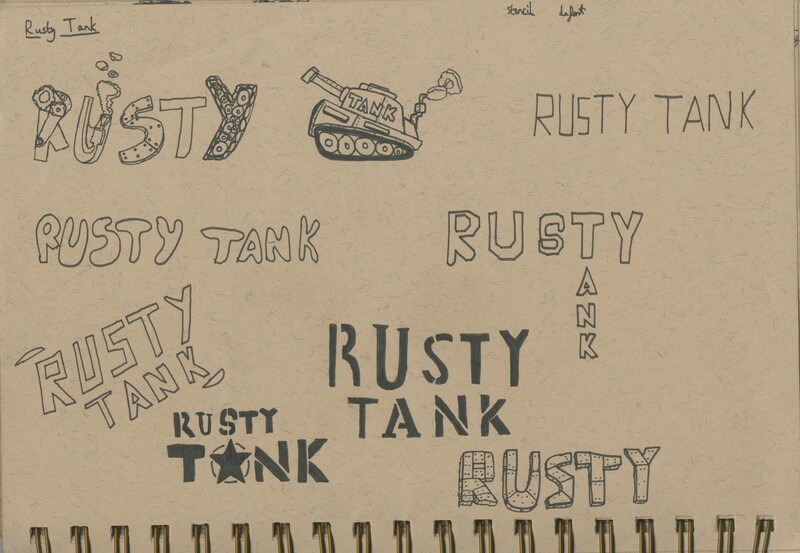 This was my final ident for rusty tank, now to storyboard the ident before i put it into after effects. 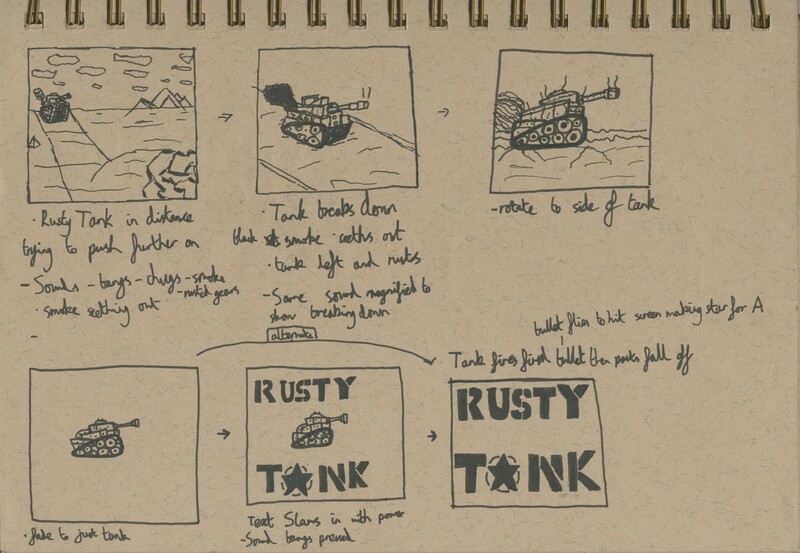 Categories: Creative Futures | Tags: Brand, Design, Drawing, ideas., ident, Identities, PHASEgaming, rusty tank | Permalink. In this lesson lead by our tutor Paul we all played a game he had made himself with involves a randomly generated task of drawing the described item on the screen in the allotted time followed by another, each had a specific time limit so therefore the longer you had the more difficult the drawing was. Examples would be draw a sphere and a cone in 5seconds, or harder would be draw a weapons crate in 30seconds. As i said these were randomly generated and we had to draw as quick as we could as accurately as possible to test our skills. The purpose of the task was to get us to not think so much about the detail final product of a drawing and to just get the quick basics or rough versions down as quickly as possible from memory, being something i did struggle with i thought this would be a very effective task on improving my personal skills in memory drawing im good when its in front of me but memory is not as good. As well as drawing from memory we had to draw in pen so there was no temptation to erase any work, as we are told erasing work is erasing progress as there is no right or wrong drawing its all progress. To start with we had 15seconds to draw basic primitive shapes such as a Taurus, cube, sphere etc. As we moved along it got harder like a bike or a shed in perspective with the same time slot really pushing the basic forms of shapes to portray the image. It moved up to 30seconds giving us drawings like messy bunk beds, weapons crate or a camera taking a picture of another object the extended time slot gave us more time to detail but the focus was to get the prime object across then to add detail roughly not a hard line finished copy just a sketch. Finally 45seconds was given for examples on page 3 like a skip full of doors, a dinosaur drinking tea or a open fridge full of food. This was the first time around and i really found it useful everyone really enjoyed drawing. So will Paul fine tuning the app and uploading the beta to his website i decided to have another 2 goes using the settings supplied to at 30minutes a piece. This was try 2 with was on random times with random difficulties. Then third time around which was set to all 30seconds hard difficulty to really test how much better i might have got. Some drawings i did i was really surprised at what i came out with, especially the flying car which looked like a inspector gadget classic mini. Overall this process was extremely useful to my personal skills as i improved my basic primitives, to get it down first then add detail, drawing in bed made me realise mistakes are good as they show progress, and then overall drawing from memory was better towards the end. 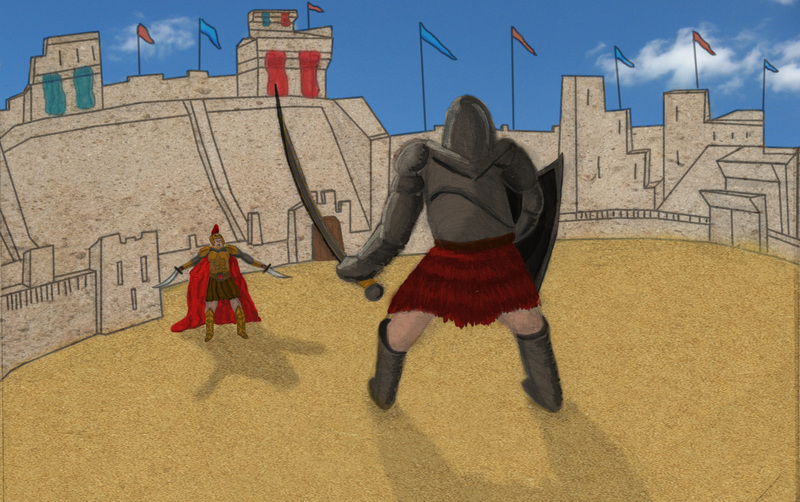 If you would like to take this task to test your drawing skills go to the app on my tutors website here. Categories: Creative Futures, Drawings/ Ideas/ Art, Research | Tags: art, Drawing, progress | Permalink.